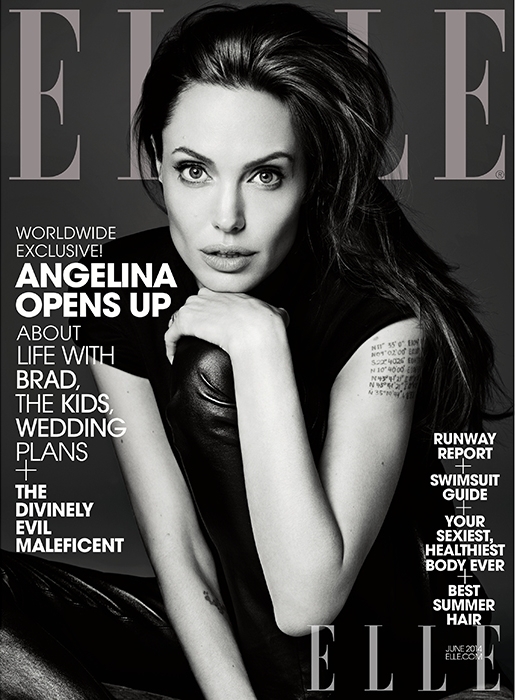 She rarely does interviews, but this month, US Elle has scored Angelina Jolie as its June cover subject. The actress is promoting Disney's Maleficent, which is set to be a box office hit. The movie, due out May 28, is already creating buzz, with a new MAC cosmetics range set to debut this month and Jolie's co-star Elle Fanning on Interview's May cover. For this particular cover, Jolie was photographed by Hedi Slimane and styled by Slimane in collaboration with Jolie, wearing a top and leather pants from Saint Laurent. "A big get for Elle. I like what they've done with her here; the raw simplicity is quite refreshing to see and it's a nice alternative to what would've been a super stylised Vogue cover," writes AL92. Emmanuelle was pleased to see Slimane shoot the cover story: "You can recognize Hedi's pictures from miles away. I like them, that is a great edit." Visualoptimism was also in favor: "This reminds me of the old school Angelina, the one I like so much! She is just so stunning — and those cheekbones." "Wow, this cover just stunned me when I saw it, absolutely flawless and I agree it's giving that early 00s Angelina vibes from when I first loved her," commented Melly5525. "This is such a big get for Elle. I really have enjoyed her latest covers and spreads where she's been ethereal and very otherworldly, but it's nice to see her being cool and effortlessly edgy again in print," writes pixiedust1603. Forum member Zorka has provided the thread with HQ's of the cover story and the rest of the issue, all which can be viewed here.